It seemed time to break out our totem pole muffin tin cups sent to us a while back by Garden of Daisies. They're so cute! We had black beans, homemade tortillas, and salad from our garden (with a boiled egg from our chickens on top). You can't get much healthier, and it's such an economic meal too! I like to soak my black beans in water overnight, and then put them in the crockpot on low with water and a cup of salsa for the day. They turn out so tender and have a slightly smoky flavor when done. If you've never made homemade tortillas, you are missing out. They're only like four billion times better than what you buy in the store. I made 12, and there were only 3 left over after dinner. The boys always love them. You can find the recipe HERE. For more ideas of recipes for kids, check out Muffin Tin Mom. That looks like it would be yummy! !! Have a great monday! oooh yum!... thanks for sharing the recipe.. I have not tried this yet. May I come to your house for lunch? ;) Looks so darn good! I have never made them, but the way JDaniel goes through the store bought kind I should. 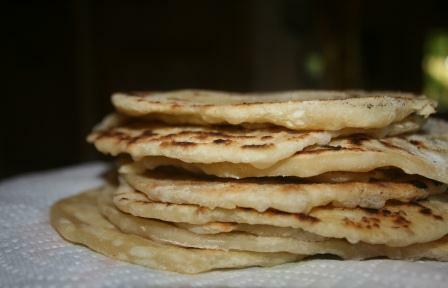 I used to make my own tortillas and they were so good. I try now not to eat a lot of carbs so I don't make many treats. I do like black beans though. Yours look great!! I love your idea for the black beans in the crockpot. That sounds really yummy, and I definitely need to make my own tortillas sometime. Looks delicious. 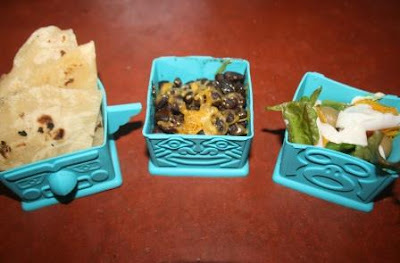 I have a hard time getting my kids to eat beans but I will definitely try! Thanks! I will def. be trying the black beans in the crock pot. Haven't done that before and I love them. Also haven't made my own tortillas. Have never tried to make homemade tortillas since Hubby is not much of a tortilla fan.... he won't eat black beans much either, guess I'm on my own when it comes to both. Darn. Yum! Now I am craving Mexican food. I will have to check out your recipe for tortillas. My grandmother used to make her own, but sadly I never continued the tradition. Maybe I need to start back up again! The tortillas look so good, I'm going to check out your link to them. I love black beans. Your meal looks so well-balanced and delicious--and fun in the tins! you've just kicked my texmex taste buds into high gear. dammit! going to try your black bean idea...And those cups may be the cutest!!!! Homemade tortillas are so yummy!! Looks like a tasty meal! I love black beans, and so does Livie. I always enjoy MTM! This looks delicious to me and I did click to get your recipe. Thanks. Hubby has shingles, so I'm off from posting again. See you soon, I hope. While moving our food store into our new home, I noticed we had 'tons' of black and red beans. I like the idea of cooking them with salsa! Now I know whats for dinner tonight! Thanks for the menu idea. It's good to be back and visiting! I love black beans. I make a black bean soup that is wonderful, very spicy though. YUMMM!! I've never made home made tortillas, I'm going to have to check out the recipe! These look soooo good, and I remember your totem containers. Will you be my mommy? But, I'm going to try them 'cause you made it sound good! This meal looks like something we are very familiar with here. And home made tortillas taste nothing like store bought. Oh ya - eggs - forcing them down a couple meals a day. Like it or not. I love to eat tortillas and black beans, I have damson chutney in my cupboard would that work instead of salsa I am wondering. Great lunch yet again. Love the little cups. And the food sounds great too. Gotta try the tortilla recipe. Thanks for sharing the recipe. I've always wanted to make my own tortillas, as my daughter loves them! I have a tortilla press but haven't used it in ages. Need to get it out! Oh I dream of a day when my boys will eat the same types of things yours do. Sigh. Those blackbeans look awesome!